Here, the primary keys of the referenced data group are shown. In this column, the foreign keys are shown. 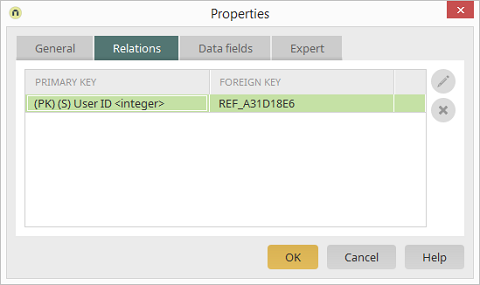 Opens a dialog where the foreign keys can be assigned provided the reference creation has not been completed yet. This page is only shown while creating a reference if the source data group is an external data group or an Intrexx data group with more than one primary key. If assignments are not defined for every primary key for an Intrexx source data group, these will be filled in automatically when you leave the dialog page.